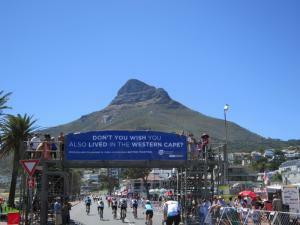 The Cape Town Cycle Tour is the largest timed cycling event in the world. Attracting in excess of 35 000 cyclists from around the globe each year, this prestigious event is definitely a unique experience for participants and spectators alike. General entries are soon to open for the Cape Town Cycle Tour 2019, and if you are still thinking about taking part in the world’s largest timed cycle race next spring, now is definitely time to secure your place! There’s some fantastic cycling holidays available for international cyclists who would like to combine the iconic ‘Cape Argus’ with some training rides in the Western Cape, a bootcamp cycling tour along the illustrious Garden Route, or perhaps something a little more relaxing such as a trip to Stellenbosch and the Western Cape Winelands, or even a Safari in Kruger National Park. Based in Cape Town, the Cycle Tour represents 109 km of some of the most scenic spots in the world. Starting in the City Centre the route makes its way down the Blue Route leading into Simonstown then turning at Smitswinkel and heading back along the coastline before the steady climb up Chapmans Peak and finally the short, steep hill of Suikerbossie. The downhill to the finish in Green Point is a welcome respite for the weary cyclist. There are approximately 16 refreshment stations and 6 medical points along the route (see route map). A team of at least 2500 volunteer from a variety of organisations ensures that all operations run smoothly and efficiently on the day. A carnival incorporating hospitality tents, entertainment and guaranteed fun awaits the cyclists, their families and friends at Greenpoint Stadium. As this is a non-profit event, all proceeds go to two charities. Pedal Power Association uses their share to develop cycling in the community by sponsoring development cyclists and hosting fun rides in the Western Cape area. The second charity, the Rotary Club of Claremont invests their share into a variety of fundraising projects. In addition to the Cape Argus Pick n Pay Cycle Tour, the Cape Argus Pick n Pay Junior Tour (6 to 12 year olds), the Cape Argus Pick n Pay Tricycle Tour (2 to 6 year olds), the Cape Argus Pick n Pay Mountain Bike Challenge and the Cape Argus Pick n Pay Expo all make up the Lifecycle Week, a series of events occurring in the week preceding the Cycle Tour.